The Skinny: Messy, uneven wuxia is also an enjoyable, entertaining ride. That is, if you can get by the simply terrible looking magic crane, which apparently was purchased on clearance at FAO Schwartz. by Kozo: This fantasy creature-feature is a rather over-the-top wuxia from Benny Chan (A Moment of Romance) and Tsui Hark. Plot: various martial arts schools jockey for position during a congregation of all the martial arts schools. Supposedly, the meeting is to discuss the boundaries of their territories, but in reality they just want to find a way to dominate each other. The tiny Tien Chong School (consisting of Damian Lau and Tony Leung Chiu-Wai) finds itself lost in the middle as infighting between the schools threatens to cause lots of problems. 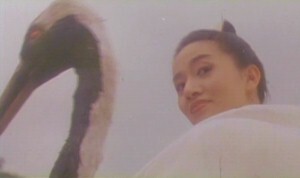 Thank god for Pak Wan-Fai (Anita Mui), a martial arts princess who possesses the “scared text” [sic] and rides the magical, intelligent, and poorly constructed Magic Crane. Pak Wan-Fai is supposed to “stop evil” or whatever these martial arts princesses are supposed to do. Complicating things is Butterfly Lam (Rosamund Kwan), who has a personal vendetta against Pak Wan-Fai. It seems her dad (and Pak Wan-Fai’s master) once chose to save Pak over Lam and she’s really bitter about the whole thing. Notes:  Ground Zero Entertainment released The Magic Crane as one half of its "Brooklyn Zu: Double Features" series, alongside an unrelated grade-Z martial arts film, Rivals of the Dragon. Surprisingly, The Magic Crane is not only letterboxed, but comes with Cantonese-only language track and embedded Chinese and English subtitles.